Adelaide Strikers take on the Brisbane Heat in a mouth-watering clash on Sunday. The Strikers took down the Hurricanes courtesy of a whirlwind innings from Jake Weatherald and are eyeing another win to keep their play-off hopes alive. In their way stand the Brisbane Heat, who blew away the Scorchers with the likes of Mujeeb and Lalor running riot. 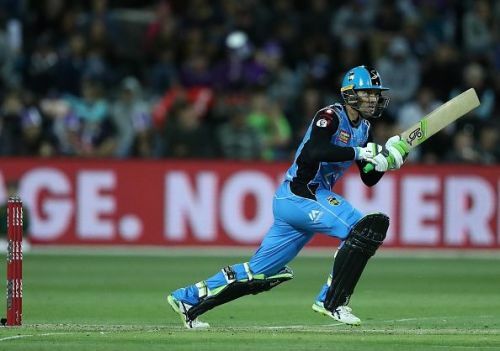 With Chris Lynn and Alex Carey back into six-hitting form, this match promises to be a highly entertaining one. Both Alex Carey and Jake Weatherald's return to form is a healthy sign for Adelaide. Their best batsmen have been Colin Ingram and Jake Wells, with both of them scoring 305 and 260 runs respectively. Jake Lehmann has also done well at number three. With sufficient depth, Adelaide are well-balanced in the batting department. Rashid Khan has been their best bowler with sixteen wickets to his name while Ben Laughlin and Michael Neser have impressed in matches. Laughlin was impressive in the death after accounting for both Hobart openers and should come up with the very same if the Strikers are to get the better of Lynn, McCullum and Bryant. Alex Carey (WK), Jake Weatherald, Jake Lehmann, Colin Ingram (C), Jono Wells, Harry Nielsen, Michael Neser, Rashid Khan, Ben Laughlin, Cameron Valente and Peter Siddle. Lynnsanity has returned to the BBL with Chris Lynn scoring a well-paced fifty against perennial favourites Perth Scorchers. He has scored 385 runs this season, ably supported by McCullum and Bryant. The emergence of Matt Renshaw has added much-needed stability in the middle order, with the likes of Alex Ross and Ben Cutting waiting in the wings. Mujeeb ur Rahman and Josh Lalor shared six wickets amongst them and will be key once again on a competitive Adelaide pitch. Matt Kuhnemann was impressive in his debut with two wickets to his name as well. He should continue to play in the side along with Jack Prestwidge, whose all-round abilities add much needed balance to a top-heavy Heat line-up. Max Bryant, Brendan McCullum, Chris Lynn(C), Matt Renshaw, Alex Ross, Jimmy Pierson (WK), Jack Prestwidge, Matt Kuhnemann, Ben Cutting, Mujeeb ur Rahman and Josh Lalor.